Blinkbox's head of PR puts Jaws and Luis Suarez in the shade when it comes to getting stuck into something. Lynsey Barber reports. In the hipster hub of east London's Prufrock coffee shop, not far from Blinkbox's offices, Ben Ayers is waxing lyrical about the company's daily news meetings like an old hack. This media obsession could be seen as quaintly old-fashioned for a digital brand such as Blinkbox, but the Tesco-owned entertainment service has put PR-led coverage at the centre of its marketing proposition to compete with better resourced contemporaries. Going toe-to-toe with Netflix, Amazon's LoveFilm, Sky's Now TV and Spotify, which is reportedly the latest to throw its hat into the ring, Blinkbox is leading Tesco's plans for a digital entertainment empire. 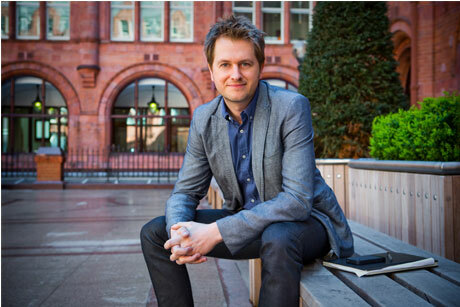 Now group head of PR for the brand and its soon-to-launch digital services Blinkbox Books, Blinkbox Music and Clubcard TV, Ayers has already managed to grab more than a few headlines to stand out in the crowded space. The most memorable outcome of his fevered news meetings was a viral campaign that gained coverage across the world. The firm offered Ryan Gosling fans a hotline to his voice, abating their devastation over the news he was taking a break from acting. 'The phone still rings,' says Ayers, with a combination of pride and bewilderment. It comes back to a lesson Ayers learned earlier in his career: a big idea can still be executed in simple ways. He also deadpans that it was overshadowed when a seven-tonne whale swam past the same spot, making global news. The media, it seems, is a fickle mistress. After deciding the ambulance-chasing of local news was not for him, he kick-started his comms career with Comic Relief. Despite the ill-fated shark stunt, Ayers' PR role at ITV evolved into managing online communities around TV shows, such as The X Factor and the news team's coverage of the 2010 general election. 'At that time, I didn't really see my role as PR because I'd gone into community. I still don't really see it as PR,' he remarks. Suddenly, it occurs to him that his job title includes the term 'PR'. 'I've always been involved in comms, but not specifically PR,' he laughs. It is understandable that he does not see a distinction, having approached comms from a PR, media owner and media agency perspective after also setting up Carat's social division. His former boss at ITV, Sophy Tobias, now head of comms at Facebook, says that despite his background as a traditional publicist he was an early adopter of social media while at ITV and 'platform agnostic'. Ayers pays close attention the weird and wacky depths of the web that he unearths through social. These are the potential sparks for an idea on which to hang a campaign. It is passion that enables Ayers to turn creative concepts into reality quickly, though he admits that not having to work through layers of sign-off at the largely 'flat structured' firm is a luxury. 'The discipline to have good ideas and the space to tease them out is the thing. I believe PR is sometimes in danger of chasing its tail, not thinking what do we want people to do, pausing and having the time to think about what to do,' he says. However, it is more of a necessity than an indulgence, and fortune favours the brave. The approach is paying off, with film studios exploring collaborative partnerships. It is also paying off for Ayers, as the seven-year-old brand accelerates into the mainstream after its acquisition by Tesco. With parallels to a recent Blinkbox campaign - the Luis Suarez Collection, featuring films such as Jaws and Silence of the Lambs - once Ayers is inspired by a challenge, he cannot wait to sink his teeth into it. Comic Relief changed everything for me. I learned about comms from the best people in the business, what passion in a workplace can achieve and how important the team around you is. Stephen Bromberg, who was head of comms at the Science Museum. He let me learn through experimenting, which was brave, and backed some of my more ridiculous endeavours. Don't pigeonhole yourself, show initiative and be prepared to roll your sleeves up and muck in. Don't misspell anything - ever. Also, be a team player and speak your mind. Generally, people value input from all angles. Initiative, passion, attention to detail, a strategic mind and curiosity about lots of things. 'A lack of quality in the debate': Is high-street betting misunderstood?